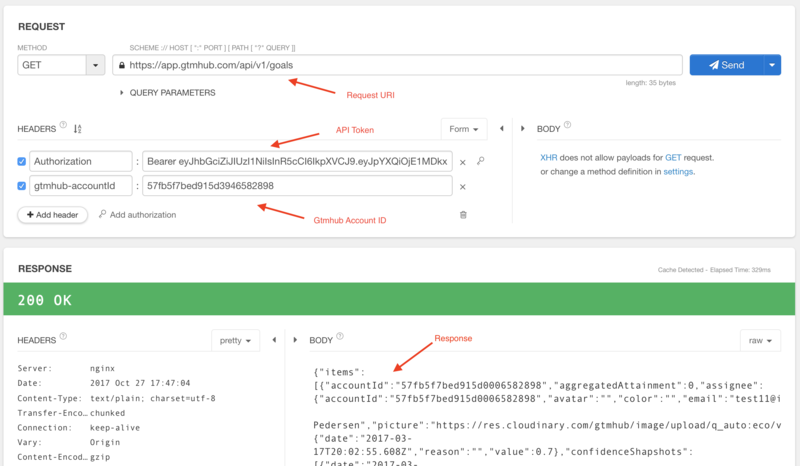 Gtmhub provides a fully exposed RESTful API with endpoints that cover all the aspects of Gtmhub. To generate an API token you need to give it a name and select the user that will be impersonated through this API token. The permissions you will have through the API depend on the permissions that impersonated user has. Example: If the user you are impersonating does not have a permission to create new objectives, you will not be able to create objectives through the API. You can easily find the Account ID in the API Tokens screen. You can use Gtmhub API from any programming language or environment that supports REST protocol. Here is a sample that illustrates how to get all objectives for your given account using Restlet Client. If you need help with any aspect of Gtmhub API please contact us.